This is the first game in the Soulcalibur series. For other games in the series see the Soulcalibur category. Soul Edge (ソウルエッジ, Souru Ejji?, a.k.a. Soul Blade) is the first installment in the Soulcalibur series of fighting games developed and published by Namco. Soul Edge is the name of the demonic sword around which the story revolves. Soul Edge is the second 3D fighter to feature characters that fight with weapons, although putting weapons in fighters was not a new concept (Samurai Shodown is an example of a 2D fighter with weapons). Apart from the aesthetic benefits, giving the characters weapons allows for a greater diversity between them, meaning there is someone for every play style. It was initially released in the arcades in 1996. A couple of months later, Namco released a fixed version labeled Soul Edge Ver. II, upon the complaints of players who found the difficulty quite high and the last boss "unbeatable". Additional changes included things such as the introduction of Hwang (initially a palette swap of Mitsurugi for the Korean version of the game) to Japanese players with a new movelist, Cervantes became playable, Guard Impacts and Air Combos were implemented, and all of the characters' movelists were changed. 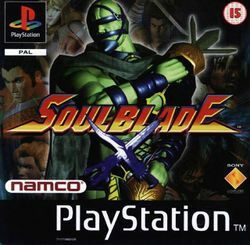 The game was then ported to the Sony PlayStation and renamed Soul Blade in Europe, North America, and Australia. This page was last edited on 21 September 2011, at 21:59.